The house we do most of our living in sits across from the smartest block in our city. The north side of the smarty-pants block hosts an elementary school, the northwest corner lends its land to a charter school, and the south side carries a middle school on its back. Mornings and afternoons cars line up outside the schools, disgorge or engorge students, and slowly drive off into whatever comes next. Some children, however, still walk to school. The other day as I was driving past the middle school, I saw a girl wearing one white sock and one black sock. 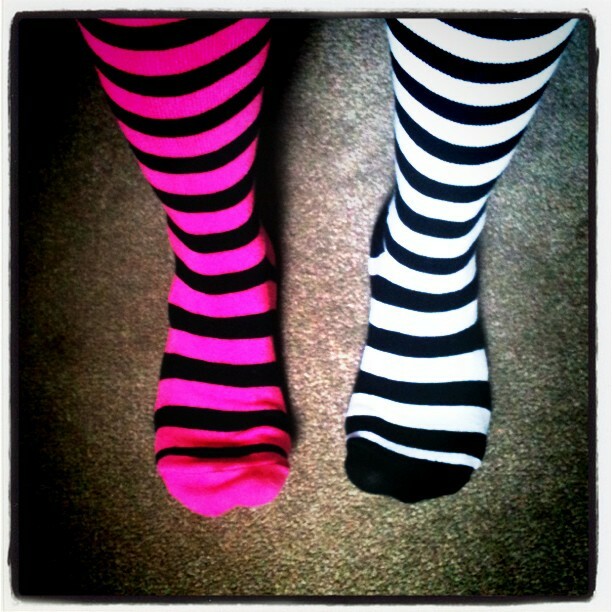 Suddenly those socks were to me, what that madeleine was to Proust. The only difference between our experiences is that I didn’t have to eat the socks to invoke my involuntary memory and Proust did. He ate, of course, a madeleine, not a pair of socks, which if he or I had done would have merely invoked an involuntary gag reflex. Oddly, that is my exact response when I remember junior high and its humiliations. My memories of that time center on the betrayal of my body. As a young child my body took care of me, balancing me on bicycles and roller skates, walking me to school and back, and carrying me through those early years without asking much in return. A band-aid for a skinned knee, a dreamsicle on a hot summer’s day, and whatever clothes I could find, mismatched or not, satisfied it. Then the change came. In health class I watched the educational films about the wonderful changes waiting for me when I arrived on puberty’s shore. I would turn in my child’s body for that of a beautiful young woman, except I didn’t. I had the same body, only pimply, hairy, and lumpy in all the wrong places. Worst of all, I could not go back to my pirate days or run wild through the neighborhood seeking adventure. Now I had an awkward body to shower, with legs and underarms that needed shaving, and parts that needed straps and hooks to harness in (the special underwear of the initiated). Everyday I had to present this new body to the world to be judged by its impossible standards of beauty. My body elicited comments, mostly from boys but also from girls, about its lack of conformity to the beautiful women who lived in our TVs, danced across our movie screens, and permanently resided in our minds. I had never been a stranger to self-consciousness or public embarrassment as a child, but most of the time I was free from of it. When the changes came, I picked up that terrible burden and carried it with me everywhere I went. Sadly I never had such a large bow nest in my hair. My hairstyle of choice during junior high was a bird’s nest. My top hair, cut short, was first permed, and then rolled into obedience each night. 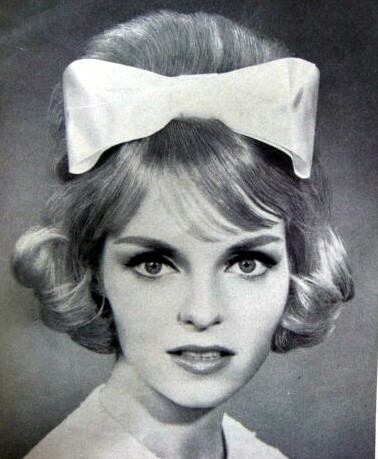 On good hair days, with teasing and hairspray, the bangs poofed down and the top poofed up creating an ideal place for a large velvet bow to perch. The rest of my hair was left long. 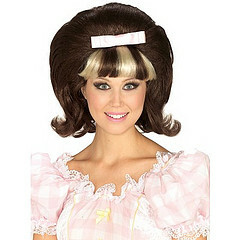 By lathering it in Dippity-Do and sleeping on rollers, I could flip the ends upward and outward like bird wings. It’s what all the bird-brained girls did. The worst class of junior high was PE because we were required to take showers, and the teacher stood near the open showers to make sure we all went through. Each day I faced the task of deciding how I would humiliate myself. I was allowed only one small towel, so I could either cover my body as I ran through or cover my hair to protect my hair. I was younger than most of the other girls because I started school earlier, so while their bodies looked more and more like women’s, my looked like it had started to develop and then changed its mind. Sometimes I opted for that first mortification, covering my hair; other times I opted for the second. In those cases, I could cover my body, but all or part of my hair got wet. I never knew if I would emerge with all of the long part straightened or look in the mirror to find one side still flipping up while the other side hung down like a broken wing. Almost always, the little nest on top turned into a soggy, frizzy mop. Why did those mismatched socks I saw the other day uncover these memories? One popular style at my school was a pleated skirt, a pullover sweater, knee socks, and tennis shoes. If you wore a white skirt with a black sweater, it was considered high fashion to wear one white sock with a black tennis shoe and one black sock with a white tennis shoe. The velvet bow in your bird’s nest could be either black or white. I could never decide which was better; both went well with the red face of humiliation I usually wore. Wow! I can relate to much of what you have written. . .I especially relate to the “Dippity-Do”. All of this post a great blast from the past!!! Oh yeah, I remember those days. I hated PE because of the stupid showers. Our gym teacher stood outside and we had to yell our numbers as we came out all wet! However, I did love dippity doo. You could do really weird things with that stuff. No one had to worry about cowlicks with Dippity-Do around. It’s like boot camp for life. If you survive, you can face almost anything. Junior High School/Middle School was a rough time! We were embarrassed, awkward, and self-conscious, and always sure that the whole world was looking at us and noticing all our foibles. They weren’t really looking at me that much because they were all caught up in themselves, except for those few moments when they would catch me at my worst and then make a cruel comment about it. It took me being an adult to realize that they were all feeling embarrassed, awkward and self-conscious, too. It’s generally a difficult time for most people. I think part of the bullying that goes on at that age stems from young people trying to get the focus of themselves and onto someone else. A world I never knew… but I recognize the feelings. So glad you survived it. So glad you’re here now. The situations are different, but the feelings are universal, I think. Ow, I feel as though I just went through PE class and had to go through the shower. Was there a manual of some sort that the instructors had which told them how to inflict the most humiliation and pain on their students? It seems as though almost everyone has had to survive this gauntlet of adolescence. I loved “Dippity-do”. It didn’t help my string-straight hair, but I always tried. What an awful, awful time. I don’t think we had showers in junior high, but just having to change in the locker room was bad enough. It’s sad how we change from small children who feel so happy in their bodies into young people and adults who feel uncomfortable with or ashamed of their bodies. We should be delighted that we have them no matter what they look like. The magic of great writing is that baring of the soul … and memories … which allow us all to revisit our own lives. And find a perfect mirror image. This tale does exactly that. Thanks so much. For the revelations and the memories. I love the idea of a child’s mismatched socks evoking such memories. It’s amazing what triggers a release from our memory banks. Smells tend to trigger a lot of memories for me. It is funny what triggers memories. You have a very good memory and your writing prompted me to recall my own junior high angst. That is an era I would not wish to re-live, would you? I was so full of myself, worried about what I looked like and what others thought of me, that I missed a lot of what was going on around me. I’d like to go back and see what I missed, but I wouldn’t want to relive those years. Kind of a miracle that any of us survive puberty. Wouldn’t it be great if we could Rip Van Winkle our way through puberty — sound asleep? The world would be a happier place. I like Proust’s idea of voluntary and involuntary memory. Those that come unbidden seem to be some of the strongest and clearest. Remembering junior high should make us especially kind to young people. Crossing into puberty can be a perilous journey. This brought back so many memories of school, PE, PE teachers, showers and generally growing up. We were made to wear grey socks back then: yuk. What seemed a matter of life and death then, now seems inconsequential. Age certainly gives us a perspective. This was an enormously interesting read – really enjoyed it. Thank mercy times have changed and no teacher stands there watching naked girls file past. HELL. I’m sure there are people who enjoyed junior high and have fond memories; I’m just not one of them. What memories this post brings back! That awkward stage when we’re going through the transition, we’re comparing ourselves to others and feeling so inadequate. Your words are very powerful. One meaning of “awk” is “clumsy;” another is “the wrong way.” Those are the years of going clumsyward and oddward.